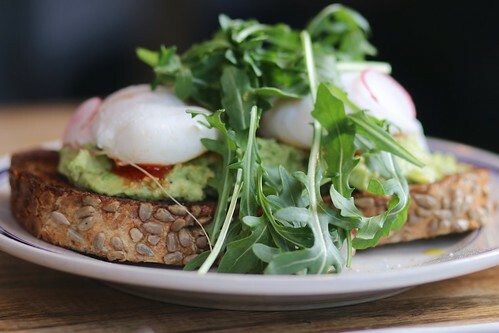 Not looking to break the bank on brunch this weekend? We’re letting you in on the best bang for your buck deals in D.C. that don’t totally sacrifice quality food and drinks. If you’re looking for a great coffee shop instead of a sit-down meal, we’ve got a guide for that too. The fun doesn’t stop at Halfsmoke. Halfsmoke is purposefully created to ensure you live your best childhood life, but with the added adult irresponsibility of a bottomless brunch. Focused around its famous sausage game, the menu is meat-centric but offers additional sweet, creative creations (including bowls of cereal). Every main entrée comes with bottomless, so there are no ifs, ands, or buts, about if it’s a good idea or not to go all in. You simply don’t have a choice. Read our full brunch review, here. We constantly get asked for suggestions for “last minute brunch, but not too pricey.” The competitive brunch scene in D.C. means planning and allocating funds are in order, especially with a large group. Bar Charley doesn’t have reservations, so you’ll never feel like you missed the brunch-booking-bandwagon. For $15 you can add bottomless to your reasonably priced entrees for a below $35 experience in the heart of Northwest D.C. Read our brunch review, here. 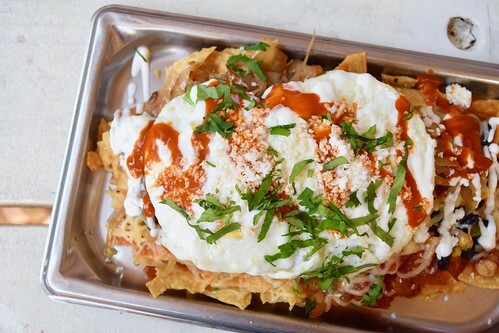 Our reliable friend El Chucho offers a casual, hipster brunch vibe with tons of fun and flavor. From tacos to chilaquiles, you can afford to have an awesome Mexican brunch with bottomless sangria or mimosas. The deck is perfect for brunch when the weather is warmer, and you won’t regret saving some dough for bar hopping later. Read our brunch review, here. Our favorite U Street spot for margaritas and chips and guacamole is an ideal place to have a low budget brunch without cutting back on good foods and fun festivities. Breakfast burritos come to about $8 and bottomless is $15, leaving plenty of change to spare for an obligatory pit stop at Nellie’s. Read our brunch review, here. All Purpose is an awesome restaurant for dinner and happy hour. Shaw and Navy Yard residents know this. However, the waterfront location serves a unique brunch experience with specialty pizzas, appetizers, and aperitifs. The bottomless option isn’t cheap per se, but the menu makes up for it when all you really need is to share a pie and appetizer per two people– you’ll be more than content. Read our full brunch review, here. Bloomingdale is one of the most low-key, but delicious destinations for grub in town. Boundary Stone, from the Red Apron group, has bottomless for $15 and entrees coming in well below that. The classic American fare from this establishment is delicious, consistent, and an affordable way to get loosened up. Read our brunch review, here. Just across the street from Boundary Stone, a dainty wine bar meets a roaring wood-fired oven at Tyber Creek. What once was an old pizza spot, is now using the pizza oven for piping hot brunch specials. 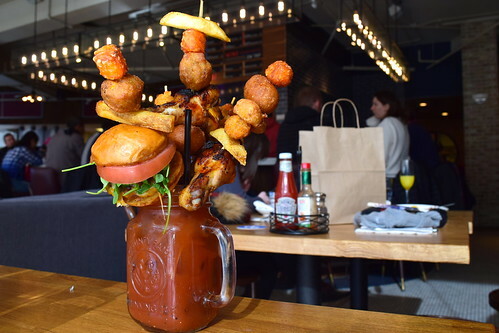 Bottomless mimosas, roses, and bloody can accompany your meal here and at the right price. Pro tip: order the cinnamon roll. Read our brunch review, here. Duke’s Grocery is where all D.C. natives bring their visitors. Though the wait is long and space can be tight if the patio isn’t open, the food, chill atmosphere, and bottomless mimosas and Bloody Marys make up for it. Nineteen dollars gets you bottomless drinks and everything except the Full Brekkies are under $13. Read our brunch review, here. For a mid-Atlantic city, D.C. has some solid Southern representation in the food scene. Navy Yard’s Due South has quintessential Southern brunch fare accompanied by serious brews. Due South could end up on the pricier side, but most brunch classics all ring in under $17. Read our brunch review, here. I didn’t really understand what Balkan food was until I moved to D.C. Turns out, Balkan brunch is a Southern European feast of epic proportions—literally. Bottomless food and drink make this $34 bottomless food brunch worth every dollar. Plus, free-flowing mimosas will just set you back 99 cents. In the heart of Clarendon bars and restaurants, Ambar is a great space to sip and snack on small plates all day. Read our brunch review, here. 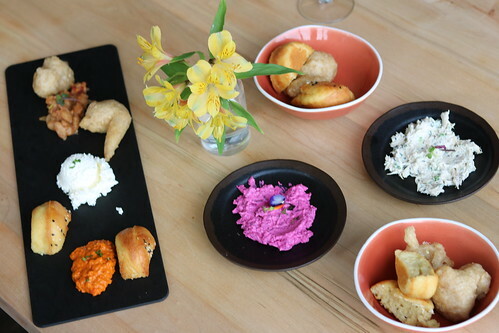 You may recognize the Cava Mezze brand from the filling custom bowls found at Cava Grill. The fast-casual chain originated from this flagship restaurant in Maryland, but the Arlington location also serves delicious Mediterranean food with ever-flowing brunch drinks. Similar to Clarendon’s Ambar across the street, Cava Mezze has a $34 bottomless option with unique renditions of our favorite brunch dishes.